This blog is heavily oriented toward inequality, which I believe to be the greatest challenge facing our country and the world. This post is intended to summarize some key elements for those who may not study it quite as much as I do, along with my opinions (of course). We can’t talk about inequality too much. I welcome your feedback. 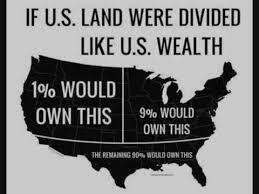 Inequality in the US is very high. Both inequality of wealth and inequality of income are very high. 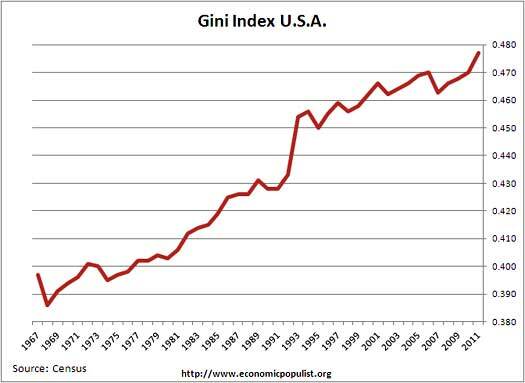 Inequality has been steadily rising since the late 60s. According to the Huffington Post, we are now among the 5 most unequal countries in the world. Only Turkey, Mexico, and Chile are worse. Some of the reasons we should be very concerned: the human impact on health and happiness of the middle class and below; the transformation of a once egalitarian nation into a nation of elites and poor; a growing number of economists agree that above a certain level of rising inequality, economic growth is slowed; the threat of protests rising; our nation’s image in the world and the attendant loss of influence, increased resentment, terrorism and war (yes, war–inequality is a major factor in wars); the ultimate threat of revolution; the future of our children and grandchildren. “Redistribution” is seldom seen in a political agenda either, for the same reason. There is objection to the suggestion of taking from those who have earned it and giving to those who might not have tried their best. 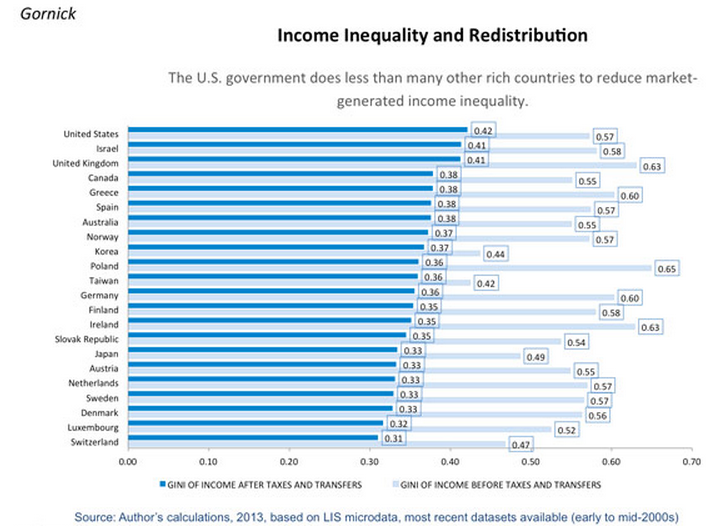 But, “redistribution” does not necessarily mean taking from the wealthy and giving directly to the poor. That’s not even the best solution in many cases. Education and infrastructure are great choices for redistribution–and the outcomes would benefit both the wealthy and the poor. The poor will get to work faster on better roads and public transportation, and the wealthy will benefit from having more and better workers, and transportation for their products. Same for education. Better jobs and incomes and better workers, especially in our advanced service economy. Conservatives continue to argue that we should not be concerned with inequality. All we need is economic growth–that will generate jobs and increasing income for all. This is the “trickle down” theory. But, there are now few economists who buy this theory. It simply has not worked. Since 1980, the US has increasingly strengthened neo-liberal (conservative) policies which have weakened unions, given corporations more power over employees and withdrawn social services to the underprivileged. During this time, under both Democratic and Republican administrations, during periods of both slower and faster growth, inequality has only steadily increased. Reduced tax rates and reduced social services are only part of the reason for increasing inequality. There are also structural factors. There is expanded globalization, which is promoted by conservatives (open borders, more trade, etc.). This means factories and jobs move without restriction to lowest wage locations, sometimes abroad, often leaving middle-aged workers suddenly adrift. Government protection for these workers existed under Lyndon Johnson, but no longer does. Another factor is technology, robotics, etc., leading to the need for fewer workers in factories, grocery stores, and at toll booths. So, both our policies and these structural factors combine to drive this ominous acceleration in inequality. No one wants to stop advances in technology, but we have to figure out a way to make the country (and the world) more equal. Reversing the trend takes time. We should use the policy levers we can, and do it now. Conservatives try to find fault with the comprehensive analysis of decades of data by Thomas Piketty, presented in his best seller of 2013, but his arguments are compelling. He shows that the rate of growth in wealth will exceed the rate of economic growth, globally, driven largely by demographics. He predicts inequality will inevitably increase over time, unless we take action. No critic has yet come forward to present a comprehensive argument backed by data, showing the opposite–that there is no reason for concern–that the trends will reverse themselves without any policy changes! No-one. If you’ve seen it, please bring it to my attention. Action involves some clear and indisputable steps, but also some very complex decisioning, which depends on different circumstances for different populations. Indisputable is the need for investment in infrastructure and education, which benefits both the wealthy and the poor. Why aren’t we at least doing that? No one has a good answer. However, much of the solution requires careful study and balancing. Immigration is an example. Certainly, immigrants do take some of the low paid jobs that some (few) Americans might want, but immigrants also bring enormous energy and talent to our economy, over time. Studies have shown they pay for themselves in taxes. Immigrants may not be Americans yet, but our concern should be for all citizens of the world, not just our country. Our forefathers didn’t pull up the ladder, and neither should we. We cannot take all applicants at one time–even the capacity of the US is limited, but we can take more than we are taking. Free trade is another complex issue. It can be beneficial, but if some foreign countries subsidize industries which then compete unfairly, we lose business and jobs. Even when that is not the case, free trade finds low-cost labor in foreign locations, and jobs are lost. A big part of the solution is in government support to the displaced, including re-training for better service economy jobs–but the nature of our political system today does not tolerate expansion of government, even to re-train our citizens who are hard-working, tax paying, and want to work, but experience sudden loss of jobs to offshoring or technology. These complexities can be sorted out with a variety of specific solutions, but we must first agree we have a major problem that must be addressed. In the meantime, since we do not have Republican agreement that there is even a problem, all the more reason to at least deal with the obvious and indisputable, such as infrastructure and education. That benefits everyone. We should do that even if inequality is not seen as a major issue in our nation. “Tax appreciated assets when inherited or transferred inter-vivos. Raise income tax rates on capital income — capital gains and dividends — to levels just below labor, e.g. maximum rate at true current marginal tax rate or 30%. And curtail practices of defining earnings as capital income, e.g. “carried interest” provisions. 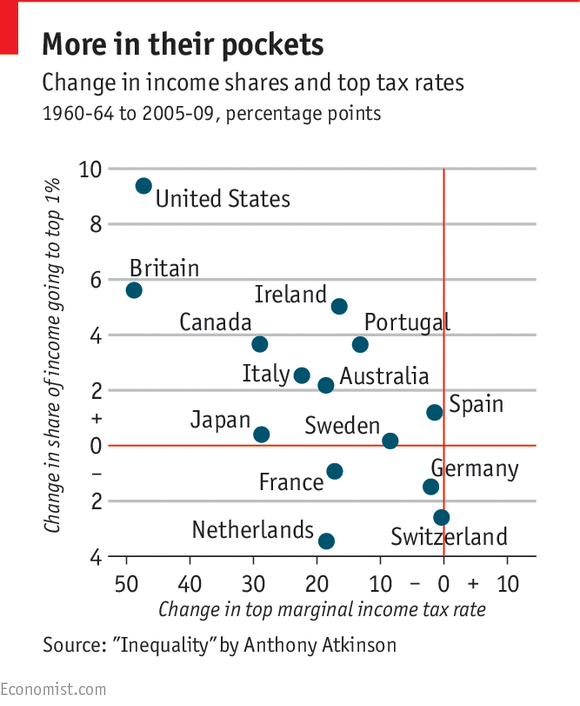 Reduce political rents: close tax loopholes that benefit mainly the wealthy (e.g. cap on deductions for employer-provided health insurance); turn deductions that benefit the richest into credits, many refundable, to benefit lower and middle-income families; allow drug purchases at “best price” rates, not market rates, for Medicare; get rid of oil and gas exploration tax subsidies; limit and phase out agricultural subsidies. Use tax revenue to improve public infrastructure (including internet). Improve college prep classes and college counseling for students. More and better apprenticeships (get employers involved). Raise the minimum wage to $10 per hour, index it, and enforce labor laws (e.g. on scheduling). Universal child allowance at $2,500 per child, refundable if this is more than income taxes owed, and separate from the EITC. A set of policies such as these would be a good start–then we can talk about how to spend the money raised by these changes. Note that Smeeding doesn’t recommend raising corporate income taxes or raising the statutory rate on earned income for the 1%. This is a reminder that rhetoric around tax changes for redistribution often becomes vehement. Changes such as these are decidedly modest, will not negatively impact motivation or capacity to invest, but they will make a significant difference in inequality! Since returning from a year studying Development Economics in London in 2013, I have had spirited debates with some of my friends. Many of them are quite accomplished, successful financially, and most of them are more conservative than I. Much as I tried, I have not been able to change their views, and neither have they changed mine. I chalk this up to a small sample experiment confirming that we all have biases, and they’re really really hard to change. It happens that I also recently read Daniel Kahneman’s Thinking Fast and Slow, filled with convincing proof of the power of biases in our decisioning. If you can find time, read it. You won’t regret the time spent. Through much of my life before my return to school, I would say I was a Moderate, well maybe a Moderate Conservative, much as I now hate to admit it. My views were heavily influenced by the Wall Street Journal, The Economist, and from friends in business, where most views were conservative, mostly Republican. I was skeptical of government, unions, activists, and I thought the free market would solve most of the world’s problems. I thought free trade was always good. I thought capitalism was solving the poverty of the world–before I came to understand the data–showing that most of the alleviation in poverty has come from one country–China. Much of the developing world has undiminished poverty, and there is still way too much in developed countries, including the US. My opportunity to get away to London was happenstance, but I had come to see across the last 30 years, that the neoliberal economic policies we were pursuing under both Republican and Democratic administrations, and which we were imposing on the World Bank and the IMF, were not resulting in better lives in the US for the average working man or woman, and not abroad either. Inequality was steadily rising, government services were being withdrawn, and capitalism was less and less restrained at its excesses. I suppose the opportunity to study came at the time I really needed a vigorous re-examination, with a body of serious scholarly work and study of real data. I guess I couldn’t justify this time expenditure before retirement. I was troubled. Things were not working out as I had hoped. I’m now a Liberal. Now I believe that none of my previous views are universally true. The world is far more complex than I had understood before. Thus, today I choose to set aside all explanations, arguments, and all the references I often search out to develop my message–or, perhaps just to support what I already think I know–my own biases. Here is some of what I now believe–with my own personal 72 years of life as my source, enhanced by recent studies. The human part of it has been with me throughout my life, but has been reinforced by better understanding of the impact of poor policies, and the political part is very much to the left of where I was before. I believe most people in this world are good. Trusting has been far more valuable to me than suspecting. Trust motivates good and distrust the opposite. Sure, I’ve been hurt occasionally with this approach, but I am confident that I’ve been hurt far less than had I operated with the other bias. I imagine the people of Russia and Iran are as good as the people of the US. I believe Muslims are just as good as Christians and Jews. I believe I would not have made it as far as I have, without being born male and caucasian in the USA. That’s not as it should be, but that’s how it is. I’m talking health, happiness, career and financial accomplishment. I would not have made it as far as I have, without the help of two good parents, good teachers, people who encouraged and believed in me, and an uncle who was distinguished and wrote letters to his prominent friends, who interviewed me and recommended me for a scholarship, which I received. My family was low income, parents were factory workers, never had savings, but both parents always had a job and we never went without food or decent clothing. If there was crime in my small town, I was never exposed to it. Had my circumstance lacked one or both parents, had my neighborhood been very low income and had the kids in my neighborhood been involved with crime and drugs, I believe I probably wouldn’t have made it. Thus, I believe many of those who have not had the natural birth benefits I had, need a little help from those of us who did. It’s not because they don’t care or don’t want to work. The vast majority of them have the same desires I have, are just as smart as I am, and would work as hard as I have, given a halfway decent opportunity. I believe the trend of the last 30 years in steadily rising inequality is the greatest risk we face. This is true in San Francisco, the US, and the world. Had we found better solutions to inequality, we would simultaneously have solved problems of water, food, immigration, and war–at least a good portion of those–because I believe what is perceived as just plain unfair, leads to frustration, anger, and strife, and addressing it means solving many other problems. I believe Bill Gates is right to observe that even the middle class is “better off” in some ways, due to technology, than 30 years ago. But, I also know that when stagnant wages are put up against the dramatic increase in costs of education, housing, and medical care, no amount of added internet connectivity is going to make up for the lost real income, the increasing worries about how to balance the budget and how to provide for the kids’ education. I believe growth of economies is necessary but not sufficient to remedy the problems of inequality. I believe redistribution is necessary. It need not be dramatic. We should be debating only how we would spend the money. I’d start with infrastructure and education. I believe raising taxes on those of higher income in our society will not reduce their incentive or reduce investment, provided only that the increases are moderate. I believe elimination of most tax deductions would help and not hurt our economy. I’ll give up mine. I believe progressive flat tax rates would benefit our economy. We also need to re-design social security. I’m willing to have mine reduced, or even eliminated. I believe there is a role for unions, and also for activists. We need this balance in our world. I believe democracy is generally the best system of governance, but it is not without its flaws, and the US system needs an overhaul. I would be happy for us to revise our Constitution to provide better governance for today’s world, instead of treating our Constitution as gospel. It was the work of a few good men a long time ago. We have a few good men (and women) at this time, who could make it much better. I respect what China has accomplished without either democracy or our form of capitalism (e.g., with State owned companies and state controls). I believe that without their own forms of government and capitalism, they could not have brought 600 million people out of poverty across those thirty years and grown to equal the US economy. I saw that the free trade policies we imposed (with our influence on the World Bank and the IMF) on Sub-Saharan African countries did not improve economies or lives there. We simply don’t have all the answers, and we should stop trying to impose or sell our system as the only answer. China’s dictatorship has worked well for the past, as it has been largely benevolent, but will probably benefit by gradual evolution to some form of democracy (not necessarily our form). We can criticize human rights, intellectual property protection, and other elements of China’s system, but we clearly deserve criticism for our failures as well. I believe capitalism is a better economic system than socialism, but capitalism should not be allowed to run unfettered. Capitalism cares not for the problems it creates for people, unless the remedying of those problems can be seen to translate into profits. I believe immigration is a great solution to the problems of inequality throughout the world, and I believe that nations who take immigrants enjoy significant economic and cultural benefit from immigrants. No single nation can accept all who desire to come in one year, but closing the borders is not a good solution for the world or the receiving country. While our government needs re-engineering and there is much waste that can be saved, I believe the answer is not in starving government. There are critical roles we are not fulfilling, and much of it should remain at the federal level. I can be called a Pacifist. I don’t rule out military intervention to protect our country or to protect human rights around the world, but I think military action should be a last resort. Evidence of the last 40 years suggests that we usually create more bloodshed than we prevent when we use military action. I am as stubborn as the next guy. I suppose no one influenced me much in the arguments I used to have about politics and economics before going back to school. However, the experience as a full time student at an excellent institution did change me. Was it my listening to some of the best professorial minds? Was it the required study of past works and vast amounts of data–which was certainly not part of my input before? Seems like change requires intense challenge and examination of beliefs and the support for contrary arguments. A lifelong registered Democrat, I have voted for Democrats and for Republicans. I remain open to voting for a good Republican next time around. I know there are some. In a perverse sort of way, I wonder whether we might benefit from a period of Conservative control of all three branches of government. Would that provide sufficient proof that conservative policies of starving government and fighting more battles overseas will not fix the problems of America and the world? Would that all of us could go back to school, maybe once every 10 years! Acknowledgments: These beliefs are broad. This post does not attempt to include the many nuances of policy in specific places and times, nor does it attempt to offer specific prescriptions. For example, it does not address where more free trade is helpful and where it is harmful, or just how to assure it is helpful. I acknowledge it is much easier to see what is wrong or what does not work, than to specify just what I would recommend as solutions. I join all the Republicans who today are criticizing our President’s admitted incomplete strategy for Iraq. So far, I find none of them who have offered up their own complete strategy. That takes careful thought–and a lot of guts!